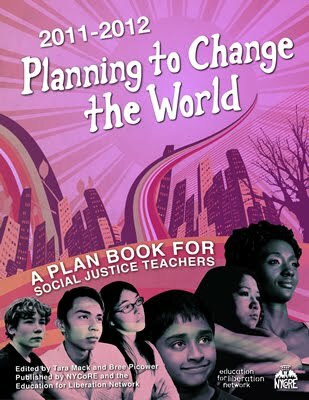 11th Annual Teaching for Social Justice Curriculum Fair! 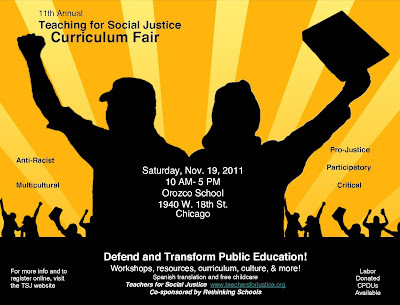 We are very excited that Saturday, November 19, 2011 will be the 11th Annual Teaching for Social Justice Curriculum Fair, co-sponsored by Rethinking Schools. This year's theme is "Defend and Transform Public Education!" In "science fair" format, and completely grassroots volunteer-organized, the Curriculum Fair will provide over 800 educators, activists, parents, youth & community members with a space to share curricula, resources, and inspiration. We'll be making friends & building relationships, exploring ideas & projects, connecting our histories & struggles. All in a spirit of social justice and education for liberation. Online registration is open: Please register here now and spread the word! *UPDATE* The deadline for Curriculum Exhibits has been extended to November 7th! Submit online here! Stay tuned for more information on program keynote speakers, performers, workshops and more!